How do you get rid of Canada geese? 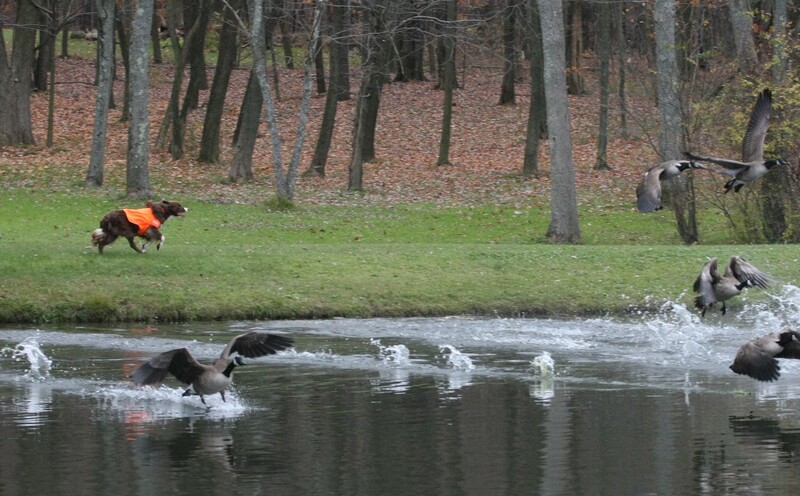 Ohio Geese Control gets rid of Canada geese with geese deterrents. Successful and cost-effective management of Canada goose activities often depends on identifying the site characteristics most attractive to the geese (e.g., security, food, nesting sites, water). Ohio Geese Control will then design a custom management program based on the potential for reducing these characteristics. Ohio Geese Control strives for an ecological approach to Canada geese management. Choosing techniques while ignoring the biological or behavioral aspects of goose activity will likely not solve the problem. Our skilled handlers and dogs can be seen working at airports, corporate facilities, parks, home owners associations, apartments, golf courses, universities and hospitals. Currently, we are located in Columbus, Toledo, Sandusky, Akron, Canton and Cleveland. 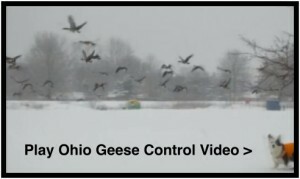 Watch our video on how Ohio Geese Control works with companies to keep geese away. Call us at 877-91GEESE (877-914-3373) for a free demonstration. You may be seeing more geese this winter on your property than usual. The mild weather keeps the water flowing and the grass accessible, which keeps the geese here longer. If you are having issues, please feel free to call us at 1-877-914-3373. Resident Canada geese are non-migrating geese; you will see them on your property year-round. The geese that stay in our area were never taught the migration patterns, nor will they teach following generations. Over the past 10 years, their populations increase about 1-5% per year, particularly in urban areas where there are few predators, prohibitions on hunting, and a dependable year-round supply of food and water. Feel free to give us a call if you see geese on site this winter. Ohio Geese Control will continue our efforts to control the geese population in a safe and humane manner. Thank you for giving us the opportunity to control the Canada geese population at Ohio Geese Control this year. Spring is just around the corner and it is a critical time of year for Canada geese management. To begin chasing off the resident geese and be there for the migrating geese we need to be in service in February to ensure relocating the geese before they nest. Starting later in the season will increase the chances of goslings at your property. Posted in Canada Geese Behavior, Canada Geese Management, Canada geese nesting, Canadian geese, Canadian goose, geese control, Geese migration, get rid of geese, goose control, Non-migratory geese, Ohio Geese Control, Resident geese, Where do geese go	| Tagged Border collies to get rid of geese, canada geese, Canada geese control, canada geese management program, canada goose, canadian geese, canadian geese control, canadian geese removal, geese control, geese deterrent, get rid of canadian geese, how to get rid of geese, Migrating Canada Geese, Migration patterns of geese, non-migratory Canadian geese, non-migratory geese, Where do geese migrate? Once Canada geese migration starts, you can see up to 200 geese on your property at any given time. It is important to harass them right away so that they do not linger and leave their mess behind. 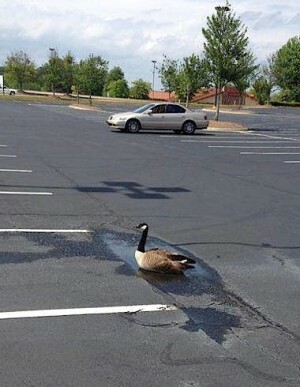 As the weather gets colder, you will see more geese hanging out in parking lots and walkways. The sun heats up the cement and asphalt during the day, and the Canada geese enjoy this warmth, particularly at night. Some of the biggest complaints we hear come from prospects are the issues of geese droppings all over parking lots and sidewalks when employees are just coming to work. Our staff is trained to look for signs of the geese throughout the day, even if the geese aren’t currently present. If there are excessive droppings consistently in the mornings, this is an indication that the geese like to roost there in the evenings. We never want you coming to work dodging droppings to get in the door. Just call us, and we will put you in our route. Migration begins in the fall in Northern Ohio. It is important to understand geese migration patterns in order to know how to deter them. Ohio Geese Control’s certified goose management professionals are trained to understand the Canada goose habits, and we will develop a specific action plan to help combat the problems you are having with geese. Just contact us for a free on-site demonstration and we can give you more details. Feeding geese will only attract more geese, and more droppings. But it is hard to argue when people enjoy feeding birds, especially the Canada goose. Many organizations like the Humane Society and the Audubon Society promote proper feeding of beloved backyard songbirds. People who love watching geese and ducks at local ponds might think they are being kind by dropping off food for the resident waterfowl. Feeding bread to waterfowl is NOT kind to the Canada goose or to your neighborhood. Bread and similar leftovers (crackers, pastries, popcorn) are easy for people to grab for a quick trip to the park, but are very hard on the geese. In fact, a diet composed of white bread can cause a bone disorder known as “angel wing” in young birds. One or both wrist joints fail to develop properly, and the affected wings will not lie flat against a bird’s body. The disorder is also known as “airplane wing.” Waterfowl with this condition cannot fly. Feeding wild canada geese leads to other environmental problems. Canada geese, like all waterfowl, depend on an extremely diverse diet to meet their nutritional needs. They browse in varied environments and nibble at grass, insects, larvae, small mollusks, and aquatic plants. Regular feeding by well-meaning visitors causes geese to congregate and then defecate in the same place where they eat, allowing diseases to spread and affecting water quality. So if you know someone who’s feeding waterfowl with bread or crackers or other leftovers, see if you can convince them to stop. That’s a true act of kindness. If geese are preventing you from enjoying the outdoors, let us know and we will kindly offer to help out. And be sure to read about our “No Harm, No Fowl” policy. Since 2004, we have been helping create a healthier and happier environment across Cleveland, Akron/Canton, Toledo and Sandusky by humanely managing the Canada geese population. Our skilled handlers and specially trained border collies engage in a herd and flight-provoking process as recommended by the Human Society of the United States. The result? Unharmed geese, public grounds that are free of droppings and satisfied customers. Jeff Hower started managing geese populations in 2000. With 10+ years of golf course management under his belt, he saw a desperate need in an untapped market. One goose produces 1-2 pounds of droppings a day and some properties can attract in upwards of 100 birds at a time. The droppings can pose a health risk and alter the established ecology of the grounds. Find out more about how to get rid of canada geese on your property by watching our video or contacting them for a goose chasing border collie demonstration. Resident Canada geese are non-migrating geese; you will see them on your property year-round. The geese that stay in Cleveland, Akron and Toledo areas were never taught the migration patterns, nor will they teach following generations. Over the past 10 years, their populations increase about 1-5% per year, particularly in urban areas where there are few predators, prohibitions on hunting, and a dependable year-round supply of food and water. During the first half of the 20th century, migratory geese were often captured for use as live decoys, and stayed in our area year-round. By the early 1960’s, the excessive hunting brought the population of Canada geese to near extinction. To counter this near extinction, the US Fish and Wildlife Service and many State wildlife agencies began a program of re-population of wild Canada geese. They did this by taking the eggs from the nests of the surviving resident Canada geese and artificially incubated these eggs while the geese laid another clutch (double clutch). These captive geese were also bred in captivity. As a consequence, their descendants do not have the biological need to migrate, they were not taught the migration patterns. Our resident Canada geese in Ohio are the descendants of these captive migratory geese. Also, the climate is temperate in our area and the water bodies do not freeze for long periods of time, the resident Canada geese have no need to fly south to find open water and grass in the winter. Even when it is 10 degrees Fahrenheit, as long as the geese can find open water, they stay warm. The water is 32 degrees and the geese have down on their bellies and chest, which insulates them from the cold water. 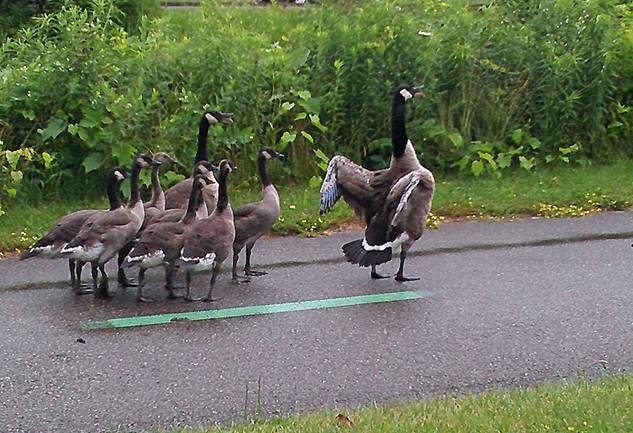 Since we have ideal conditions, and the resident geese are trained to stay in our area, the problem will only increase. If geese are becoming a nuisance on your property during the winter months, please let us know. We are happy to set up a custom program to manage your Canada geese population. Posted in Canada Geese Behavior, Canada Geese Management, Canadian geese, Canadian goose, Geese migration, get rid of geese, Non-migratory geese, Ohio Geese Control, Resident geese	| Tagged Border collies to get rid of geese, canada geese, Canada geese control, canada geese management program, canada goose, canadian geese, canadian geese control, canadian geese removal, Fall migration, geese control, geese deterrent, get rid of canadian geese, get rid of geese, how to get rid of geese, Migrating Canada Geese, Migration patterns of geese, non-migratory Canadian geese, non-migratory geese, resident Canada geese, resident Canadian geese, Where do geese migrate? It is the molting season for Canada geese. Geese rejuvenate their flight feathers for their Fall migration beginning in mid-June throughout the month of July. Unlike other birds which will loose one feather at a time and still be able to fly, geese will loose all of their flight feathers (or molt) and not be able to fly during this stage. You will begin to see lots of feathers on your property when the molt is happening. Ohio Geese Control has continued to do extensive harassment to keep the geese away before the molt happens. We do not work with our border collies during the molt, as the geese will be unable to fly off. Habitat modification efforts and fencing off areas will help reduce geese walking onto your property. If you are having issues, you can certainly call us and we will develop a custom plan for your property during this time. Call us at 877-914-3373 for a free site demonstration, you will see a great decrease in the number of geese on site. The flu hit our family hard this season, and it sparked a conversation in our household about what diseases Canada geese carry and if it is a health risk to our clients. After all, they do leave large quantities of feces everywhere. A single goose can defecate every 20 minutes up to 1.5 pounds each day. And it only gets worse when about 67% of these geese are non-migratory (resident geese), and their year-long presence does not give the land or lake any rest to rejuvenate. So when I see beaches and soccer fields littered with accumulated goose droppings, I wonder if we should allow our kids to play in the area and what information we should give our clients. So we did a little research to find out the truth. Research has shown that the excrement of geese contains a wide variety of pathogens capable of infecting humans and that can also be transferred to the water and air quality. However, the transmission of disease or parasites from geese to humans has not been well documented. The parasites do exist, so the potential exists, and the higher number of geese the higher the potential. But since there are gaps in the research, we do caution that the presence of a disease does not necessarily translate into a threat to public health. Parasites can cause diarrhea and infection, especially in individuals with compromised immune systems. Three parasites that are a concern to humans are cryptosporidium, giardia and toxoplasmosis. Infection may occur through eating a goose that is undercooked or drinking contaminated water. Caution should be observed when swimming in any lake, pond or beach area that has a presence of geese. 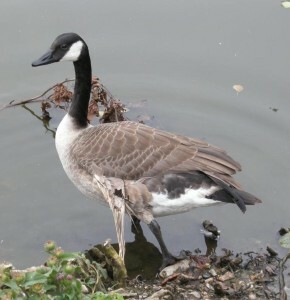 The bacteria transferred from Canada geese that cause humans concern are chlamydiosis, e-coli, listeria, pasteurella multocida and salmonella. Infected birds can shed the bacteria through feces, nasal discharge and when someone is bitten. Humans normally manifest infection by pneumonia or through a wound. 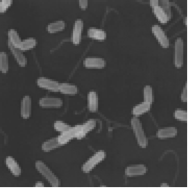 The presence of e-coli correlates to the temperature, so there is a higher probability of e-coli presence during the month of June rather than February. Unless you are working around Canada geese or involved in feces clean up, the risk of infection can be low. Canada geese are members of a group of birds that have been known to contract avian influenza. In 2004, researchers confirmed that Canada geese could contract H5N1, and it is an on-going concern that geese can introduce the disease. There is on-going research to help validate these concerns. Lastly, histoplasmosis fungus grows in soil enriched with bird droppings, including those from geese. 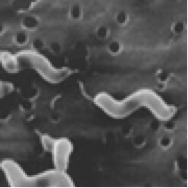 When these contaminated soils are stirred up, the fungal spores can become dispersed and inhaled, thereby infecting individuals. Goose droppings have not been identified as a source for histoplasmosis, however, in light of the conflicting information, we suggest people practice caution when raking, mowing or stirring up soil enriched with goose droppings. It does not appear that goose droppings on sidewalks and other non-soil surfaces pose a risk. As a general rule, keeping a distance from geese and areas frequented by geese will always be the first line of defense in combating any diseases that geese can carry. Individuals with compromised immune systems should be extra cautious. The best way to combat coming in contact with diseases carried by Canada geese is to proactively keep the geese away from areas that are used by people. The first action is always to stop the public from feeding the geese. Secondly, the most effective, safe and humane tactic is by far the use of border collies. Find out more tactics here, or call Ohio Geese Control (877-91GEESE) for a free on-site demonstration and consultation on what you can be doing to lower your Canada geese population. Research has been proven that geese and their feces do carry diseases that are capable of infecting humans. But we must emphasize that the research is ongoing, and there are very few documented cases of the transmission of the diseases to humans. Nevertheless, the potential does exist, so we would urge you to practice safety measures when coming into contact with a high number of geese on your property. And check back with our blog as we provide updates. Canada Geese are known for their seasonal migrations. Each fall hundreds of thousands of Canada geese pass through Ohio in their famous v-formations, honking up a storm. When you look at a large flock of Canada geese, they all look pretty much alike. However, in North America there are at least 7 different groups of this species, each having a different breeding and wintereing area and they travel different migration routes. Due in part to the interbreeding of various migratory subspecies with the introduced non-migratory Giant subspecies, Canada Geese are frequently a year-around feature at many urban environments as well. Peak migrations happen in Ohio between October and November. Flocks of geese fly in a v-shaped group and some will travel non-stop for up to 16 hours to cover over 800 miles. Flocks will also make shorter flights depending on wind patterns and where food is available. During migration, geese can travel as fast as 70 miles per hour with a good tail wind at an altitude of up to 9,000 feet. Geese, like most of our migratory birds, will also migrate during the night. Ohio Geese Control understands the patterns of migrating geese and tailors our service around those patterns, creating a custom geese management program for our clients. Contact us if you have a Canada goose problem, we will set up a free site demonstration to help educate your team and develop a custom program. Posted in Canada Geese Behavior, Canada Geese Management, Canadian geese, Canadian goose, Geese migration, get rid of geese	| Tagged Canada geese control, canada geese management program, canada goose, canadian geese, canadian geese control, canadian geese removal, Fall migration, geese control, Migrating Canada Geese, Migration patterns of geese, Where do geese migrate?